In 20 days No Book Unread project will be one year old, so somehow it feels appropriate that I should review a book by Sir Terry Pratchett, one of my all-time favourite authors. I've been reading his books for years now. Unfortunately I feel lost for words, I've been sitting in front of a blank page for the better part of two hours now. Much as I'd like to gloss over this fact (and pretend that I knock these out in an hour) I feel compelled to mention why the right words elude me. So, let me indulge in a bad habit of mine for a moment: giving too much back-story. Sir Terry Pratchett has long been an inspiration to me. He was an inspiration to many people for many different reasons, but to me in particular I was always in awe of Pratchett's ability to create a comical story while still making you care about the characters and the plot. He seemed to believe that comedy didn't have to be just comedy, which is something I feel that many other comedies seem to forget. Not to disparage a good series, but, Hitchhiker's Guide to the Galaxy was just comedy. The characters didn't develop much, if at all, and the world felt bereft of lasting consequences. Of course, not every story needs those elements and 'Hitchhiker's' seems to work just fine without them, but it is a trend that is apparent throughout comedy as a whole. Movies are especially guilty; the story often only exists to provide more opportunities for the comedy to shine, and characters rarely seem to change beyond an, almost obligatory, lesson in friendship or romance. I suspect part of the problem is that any story that contains more than just comedy elements always seems to relegate comedy as a secondary characteristic, such as drama-comedy, horror-comedy, or romantic-comedy. I'll touch more upon that another time. Terry Pratchett, however, always seemed to weave his own particular brand of fantasy with comedy effortlessly, while still having fully fleshed out characters who, despite stereotypical superficial traits usually possess surprising depth, and stories that are integral with the comedy. I think the first time this really sank in was when I read Sourcery. The story contained the return of characters from previous books (Terry Pratchett introduces new protagonists half the time) and featured a serious and, though I hesitate to use the term, epic series of events that forced some truly profound outcomes. (Sorry for the vagueness, didn't want to spoil anything.) I began to respect Sir Terry Pratchett more and more for his ability to tell a serious story with fully-realized and relatable characters in a comedic way. The fantasy of Pratchett's stories wasn't just tinted with comedy though, the comedy was inextricable from the fantasy, it was part of the flavour of the world. I think it was around that time that I decided one of my life goals would be to meet Terry Pratchett. Moving Pictures is the story of how Discworld learned how to make movies, or rather 'clicks' as they were called in the book. The twist is that the movies, even down the conception of the idea, are linked to an otherworldly force that has found its way into the Discworld. The movies don't just sway the hearts/emotions of the viewers it also affects their minds. As a result Moving Pictures draws heavily from Hollywood stereotypes and movie tropes. Many of the jokes are quite obvious puns or reversals or plays on popular movie scenes. For example, the small town that springs up around the invention of 'moving pictures' is called Holy Wood. Perhaps it's because I'm not a classic movie buff but the story never quite hit its stride for me. There were a lot of different elements and story threads that just didn't seem to come together in the right way or hit their mark. Moving Pictures, although I wouldn't call it a bad book, doesn't quite suit me for two main reasons. One, and I hate to say it, the protagonist is one of the weakest characters, and, two, the premise relied on clichés and felt as though it was building up to a finale that was never quite realized. The interesting thing about Moving Picture's protagonist, Victor, is that he is actually quite similar to the lead in Pyramids, Teppic. Victor is a wizard in training who never quite becomes a wizard, and Teppic was an assassin in training who never followed through either. Both protagonists were called away to distant lands, were entangled with other-worldly forces, are young men with no particular goals in life, and both were accompanied by irritable potential love interests. Aside from Victor's similarities to Teppic though, the real shame is how passive of a lead Victor is. The fact that Victor's character is so aimless kind of leaks into the story. Victor is so laid back that he gets dragged around a lot by circumstances, yet for all his aimlessness he never seems conflicted about his lack of direction or his situation. When it comes down to it Victor doesn't seem to have any particular ties to the past or present and doesn't seem particularly concerned about the future either. That's frustrating and annoying, it's not natural! At least Teppic was troubled by his sudden appointment as a King in Pyramids. As a result Victor ends up being outshined by just about all the side characters who are more interesting, more opinionated, and frequently more relatable. In particular Gaspode (the wonder dog) was a show stealer and eminently more sympathetic as a character for his tendency to be overlooked, ignored, and overshadowed. Gaspode had goals, he had opinions, and he had problems yet still looked out for his friends. If nothing else the biggest difference between Gaspode and Victor was that Gaspode was clearly defined while Victor's personality is still amorphous in my mind. The other glaring problem that Moving Pictures seems to suffer from is that is fails to nail the climax of the story. From the beginning there is this sense of foreboding that was expertly weaved between the events so it was always there in the background. So the entire story had this feeling of tension that everything was building up to a rapid boil and at any moment could spill over. Aiding in this were certain repeating story elements, such as '1000 elephants' and 'the golden man' that seemed to hint at pieces of a chaotic and show stopping climax that didn't quite happen. That sense of foreboding was a powder keg in a shower of sparks that smoked briefly before quietly going out. In the end, somehow I felt cheated. 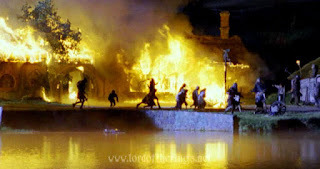 The burning of the Shire. The simple explanation is that Moving Pictures tried to have a double climax which, in theory could have been really good, but in practice the energy of the finale just ended up being split. I haven't read them myself (yet) but I have heard that Lord of the Rings books don't end upon the defeat of Sauron. I am told that after Sauron is gone the hobbits return to their hometown only to find that Sarumon has taken over the Shire and one final battle ensues. Now, imagine if the movie had ended like that. It would take away from the energy of the previous final battle wouldn't it? That's how the end of Moving Pictures feels. There is this great build-up which brings all the big characters together in Ank-Morpork where they are all entangled in this crazy series of events that actually works quite well. Then, just as everything comes to a head, and a rampaging abomination is taken care of everyone goes back to Holy Wood to take care of some unfinished business. This is followed by a traveling sequence that ruins the energy of the climax only to be followed by a less intense climax in some ruins in Holy Wood. The worst part of it all is that even with the moment of down-time between scenes no one ever really stops to grieve for two characters who seemed to have been lost in an explosion. Thinking about the sequence in the ruins, my so-called second climax, it was probably intended more as part of the resolution. To me, though, it simply seemed to be a truncated piece of the main climax, and by-and-large didn't really wrap up as much as I was hoping it would. Also detracting from the second climax was that fact that there technically wasn't any sound. While I'd like to say that this doesn't really matter in a book you also have to admit that everything you read affects how you envision the story in your head. And, unfortunately, complete silence doesn't really add to an action sequence. My other complaint about the ruins climax/resolution was that not enough was resolved, so the story ends with a lot of things feeling, well, unfinished. Victor never quite decides what he is going to do next or really gets involved with his potential love-interest and acting partner Ginger. Ginger pretty much ends up a lot like Victor once she is deprived of an acting career at the end, unsure of where to go or what to do. And the new Arch Wizard who was involved in the Ank-Morpork climax is just never touched on again. I suppose the beauty of the Discworld is that he could always crop up again in a future book but in the short term it was one of my bigger gripes. As for Gaspode the wonder dog, he once again steals the show with a resolution that was equal parts bitter and happy. His resolution was by far the most satisfying as well as the most emotional. Moving Pictures, overall is still a good book but it doesn't live up to Sir Terry Pratchett's previous precedents. I've been reading the Discworld novels in order of release so I've developed a feel for Pratchett's style. Like any good Discworld novel Moving Pictures has plenty of funny smile-worthy moments, and even a few chuckle-worthy moments. I just didn't have to suppress laughter in the same way I've had to for some books like Eric. The story is pretty well executed too but it lacks the same sort of weight that some of the others had. The nature of the conflict just has this outlandish quality to it, if only because it borrows from Hollywood so much. The story did manage successfully juggled a lot characters really well too without neglecting any until towards the end though. Yet, for everything that was successful there were a lot of areas that felt as if they were too short or were glossed over. At times I felt like I had skipped a page or two and more than once I felt like I had missed a joke. Maybe part of the story's perceived failings were due in part to my own ignorance. I could be off the mark here but Moving Pictures feels as though Pratchett got tired towards the end of the story and just wanted it to be over so he could work on other projects. At least in page length Moving Pictures is close to 60 pages longer than any of his previous works, so it wouldn't surprise me if the story had started as a promising idea that had just grown out-of-control. My own ideas have done that to me more than once. In the end it's still worth reading, especially if you are a fan, but I definitely wouldn't put it forward as my hook to get someone new reading Pratchett. I hope Terry Pratchett wouldn't mind this critique, as at its heart is a love of his writing, his world, and his characters. I won't be able to meet him in-person now, but someday I'd still like to visit him. He has been one of my biggest inspirations for pursuing writing. I hope one day that I will be half as talented a story-teller as he was.